Picking up where San Sebastian’s main La Concha Beach ends at a rocky outcrop called Pico del Loro, Ondarreta Beach is a shorter stretch of sand that’s nonetheless just as lovely. It offers the same postcard-perfect views of La Concha Bay, Santa Clara Island, and Monte Igueldo and Monte Urgull, the two hills that bookend the bay. Much like La Concha Beach, Ondarreta Beach is backed by a promenade and can be reached from La Concha by walking through the Tunel de Antiguo. Only slight less busy than La Concha in summer, this beach is popular with sunbathers and volleyball-playing locals. 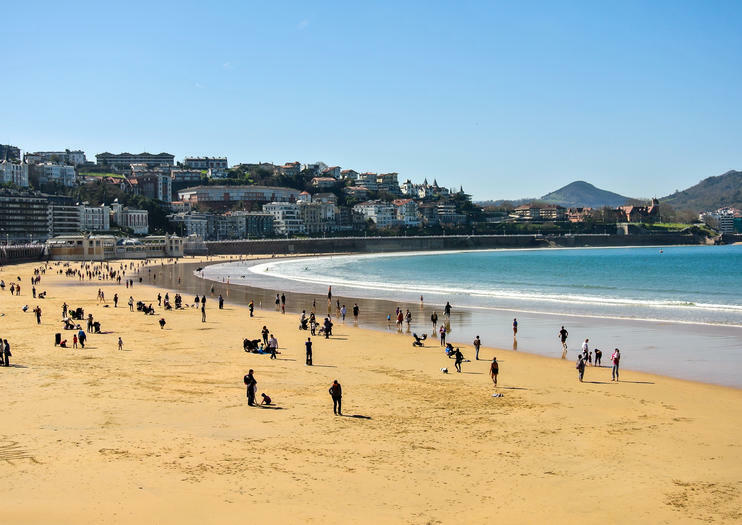 A bike tour is a great way to get a look at the beach scene in addition to other San Sebastian attractions. Ondarreta ends at the foot of Monte Igueldo, but if you continue along the promenade, you’ll reach a renowned piece of outdoor art by sculptor Eduardo Chillida entitled “Peine del Viento,” or “The Comb of the Wind.” Since 1977, these three pieces of curved steel, set into the rocks along the bay, have been pounded by wind and water. Ondarreta Beach has sunshades for rent. You can purchase snacks and drinks at a refreshment stall. Canoes and kayaks are also available for rent. Ondarreta is centrally located and easy to reach via bike or on foot. Additionally, the bus stop along Satrustegi Hiribidea, which runs behind the beach, is right nearby. You can also walk from Old Town, which is about a mile away. On busy summer weekends, go early to stake out a spot on the beach. Or, opt to visit around sunset, when the light is perfect for photos and when temperatures cool off a bit. La Concha Bay’s western headland is a great place for an uphill walk before relaxing on Ondarreta Beach. Take in views over the bay and Santa Clara Island, or visit the small amusement park. If you don’t feel like walking, hop on the Funicular Monte Igueldo instead. Verken de Baskische geschiedenis en eigenzinnige charme van San Sebastián tijdens deze 2,5 uur durende fietstocht. Fiets langs stranden, rivieren, slagvelden en baaien met een slimme gids, langs passerende aristocratische paleizen en avant-gardistische pinxtobalken. Met een ontspannen tempo en de flexibiliteit om vaak te stoppen, is het een geweldige manier om kennis te maken met de contrasterende historische hoogtepunten en moderne vibe van San Sebastián.